No other player on the market has come as close to the same feel, mechanics and performance of a traditional vinyl turntable as the new digital turntable from Denon, the SC-3900. Of all the CD players I've used in my career, I've felt the SC-3900 is as close to a classic Technics 1200MK2 as you can get. The fact that it uses a real vinyl record that not only actually spins, but it also allows me to execute the same techniques I did on a vinyl turntable that I couldn't do on other CD players especially when it came to scratching. The SC-3900 has not only been designed for the professional mix DJ but it allows performers of a technical caliber such as scratch artists and turntablists to utilize the player the way they would on vinyl turntables. I know that vinyl emulation has been around for a long time now but from what I've seen and heard from many DJ's is that there's a reason why they haven't fully transitioned over to CD table tops completely until they got their hands on the 3900 and the previous unit, the DN-S3700. 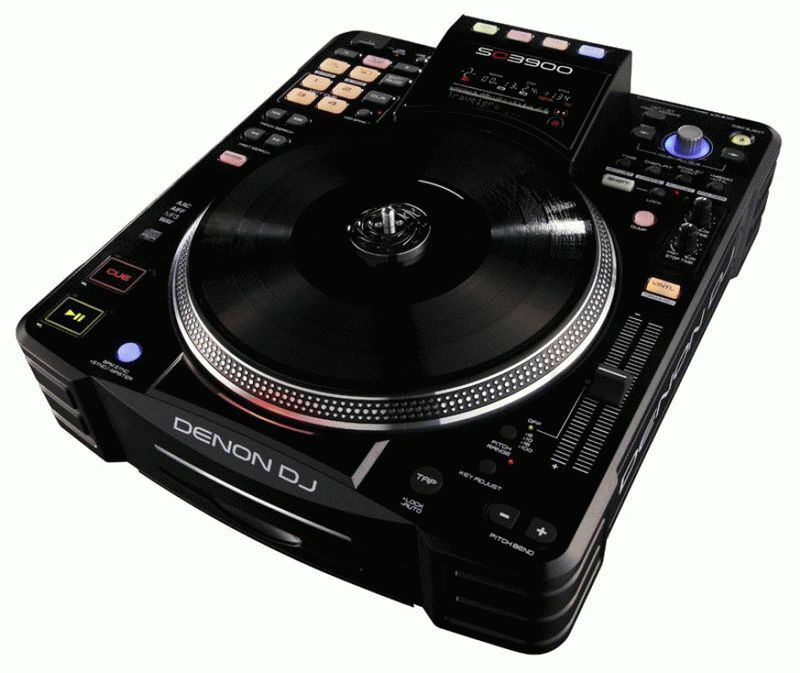 The Denon SC-3900 is Denon DJ's newest flagship player. Like it's predecessor, the DN-S3700, the SC-3900 virtually shares the same dimensions plus supports the same features such as looping, four hot cues, track search, an LED screen, pitch control with pitch bending control buttons and the famous 9" direct drive spinning platter. It also supports, CD's, USB, or Midi for audio playback. The SC-3900 and the DN-S3700 may look close to identical but the changes in the layout are clear and more convenient to the table top user. Such features have been relocated such as the reverse, brake and dump buttons. The break parameters can now be adjusted through the internal settings as well as two new added vinyl speed adjust knobs located to the right of the unit above the pitch slider. All the hot cues now have their own independent functionality as supposed to the fourth hot cue sharing the same button as the loop in button on the previous unit. The SC-3900 has a new auto loop feature that can be adjusted by shortening or extending the loop with the plus and minus buttons located on either side of the auto loop button. The hybrid mode, which provides unlimited timecode for DJ software like Serato's Scratch Live, Virtual DJ and Tracktor, now comes factory installed with the unit which can be accessed through the midi function. The USB port has been relocated to the top of the unit for easier access, especially for DJ's who keep the unit in road cases. The SC-3900 can also be linked up to 4 of the same units and can playback audio through one single USB stick. The start and cue buttons have been replaced with hard plastic buttons to give a more precision execution compared to the rubber buttons on the 3700. The on board effects like the flanger, echo, and filter have been removed. Statistically most DJs execute effects through the mixer because of the numerous effect options and hardly through the CD player. Most of all the direct drive platter, which carries the same look and emulation as the traditional Technics 1200 plus also using a real spinning vinyl record to truly make the DJ feel like they're keeping it "old school", has a new and improved feel. The torque adjustment can be adjusted to the DJ's ideal preference. The Denon SC-3900 has been designed for DJ's of all walks of life. In my experience, I've found that the SC-3900 is useful for both mobile and club applications. In the club atmosphere it not only gives a stellar performance but the accessibility and convenience to DJs that don't want to carry laptops or CD's because of the USB feature or the fact that it does play MP3 CD's if you decide to use the CD drive. In mobile DJing, the SC-3900's just give it a nice traditional look that seems to capture people's attentions because of the authenticity and the design. Most people become curious when they see the vinyl record spinning and their curiosity becomes apparent to find out if the DJ is actually spinning vinyl. When they find out it's an actual CD player the reaction becomes priceless. To younger audiences such as prom guests, sweet 16 attendees or in a high school dance, the player makes the DJ just "look cool" in my opinion. The SC-3900 can fit into a standard CDJ road case which still makes the unit light enough to carry and you can fit two of them into the trunk of a car. The best thing I like about using the Denon SC-3900's is that it's lighter than a Technics 1200MK2 but performs like a vinyl turntable.